Mineral Mizer II | O-So Pure, Inc. The Mineral Mizer II is the ideal, green way for all practices to eliminate the expense, inconvenience, inefficiency, and injury risk associated with bottled distilled water. 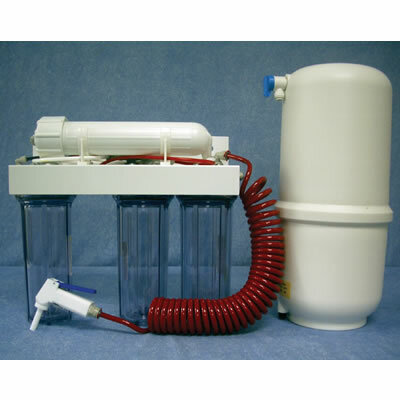 O-SO Pure introduces the Mineral Mizer II, an economical alternative to distilled water solutions for a practice's sterilization center. The newly released Mineral Mizer II Deionized Water Supply includes a dispensing gun that extends up to 15 feet for direct filling of autoclave and sterilizer water reservoirs. The Mineral Mizer II consistently produces high purity water acceptable to modern sterilizer equipment, including those with internal water quality monitoring. Unlike onsite distillers, the Mineral Mizer II requires no electricity and produces up to 3 gallons per hour. The dentist will appreciate the durability and feel of the dispensing gun, which is milled from a solid Teflon block. Combined with the 15 foot reach of the coiled hose and the 3/8-inch throughput from tank to reservoir, this feature has been engineered to minimize the time required to fill sterilizer reservoirs. The economics are better than distilled water on a cost per gallon basis for most practices. And eliminating storage and staging of heavy distilled water bottles makes for happier, healthier staff members.